Boil potatoes in salted water until tender, about 12 minutes. Drain potatoes and pour them into a bowl. Combine sour cream, egg yolk and cream. Add the cream mixture to potatoes and mash until potatoes are almost smooth. While potatoes boil, pre-heat a large skillet over medium-high heat. Add EVOO to hot pan, about one turn of the pan, with beef or lamb. Season meat with salt and pepper. Brown and crumble meat for 3-4 minutes. If you are using lamb and the pan is fatty, spoon away some of the drippings. Add chopped carrot and onion to the meat. Cook veggies with meat for five minutes, stirring frequently. In a second small skillet over medium heat cook butter and flour together for two minutes. Whisk in broth and Worcestershire sauce. Thicken gravy, about one minute. Add gravy to meat and vegetables. Stir in peas. Pre-heat broiler to high. Fill a small rectangular casserole with meat and vegetable mixture. Spoon potatoes over meat evenly. Top potatoes with paprika and broil 6-8 inches from the heat until potatoes are evenly browned. Top casserole dish with chopped parsley and serve. In Recipes-list.com we have selected the most viewed recipes from category - uncategorized . Enjoy the best recipes specially selected for you! 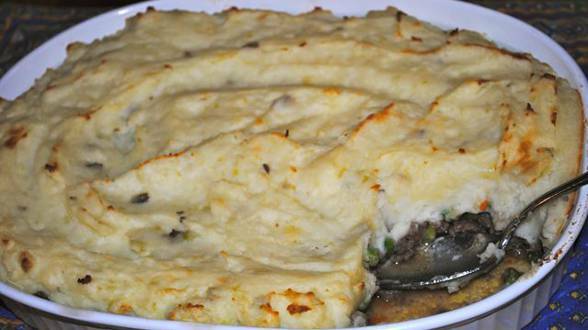 30 Minute Shepherd’s Pie is the right choice that will satisfy all your claims.